"E.T. L'EXTRA-TERRESTRE : LE 20ème ANNIVERSAIRE"
"E.T. 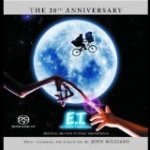 THE EXTRA-TERRESTRIAL the 20th Anniversary"
4 OSCARS (ACADEMY AWARDS) : best music original score. 1 GOLDEN GLOBE : best original score. 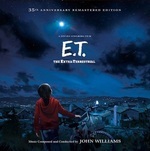 3 GRAMMY AWARDS : best album of original score written for a motion picture/best instrumental composition "flying" theme from E.T./best arrangement on an instrumental recording "flying" theme from E.T.